Hi Friends: I liked the techniques from my recent Thanks tag so much that I created this Noel tag with the same process - pretty cool that the theme and colors create such a different effect even though I used the same basic process. Please see below for photos, process, challenges, and supplies. Have a super day! I started with a plain manila tag and used the Remnant Rub Resist technique to create the background, using the Distress Stains listed below. To add more texture, I stitched around the edges of the tag with my sewing machine. 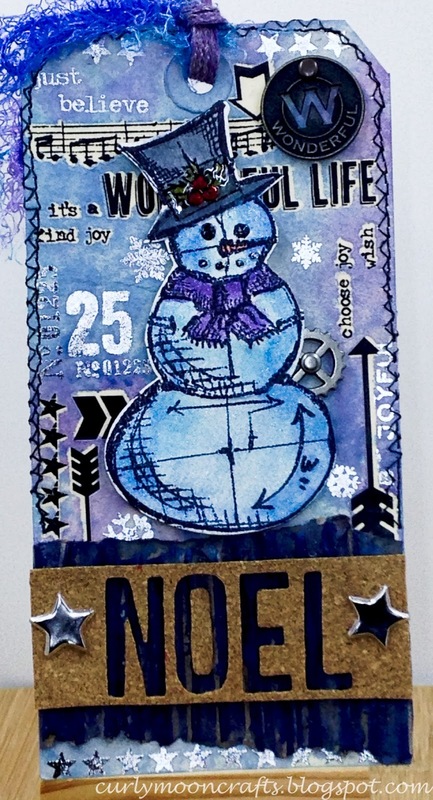 I stamped the snowman onto watercolor paper with Archival Jet Black ink, cut it with the die, then colored it using the Dimensional Coloring technique and the Distress Inks listed. I mounted it to the tag with fun foam, then added some Glossy Accents to the eyes, mouth, and hat band. I used some red gems for the berries on his hat, and added some glitter pen to the entire snowman to get that shimmery look of the show. 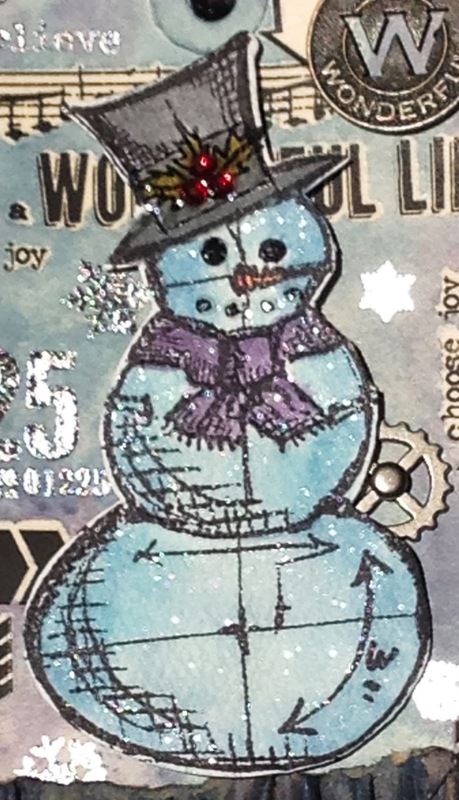 The full photo captures the colors well, but washes out the glimmer on the snowman because of the shine of the silver remnant rub - the detail photo kind of shows the sparkle of the snowman, but it's really much prettier in person. I die-cut the word "Noel" from cork paper, then layered it over some re-purposed corrugated paper that was died with Distress Stain - then added some silver star brads to the sides of the word. I also died some Linen Ribbon with the Distress Stains, used a bit of blue/purple fibers from my stash, and tied them to the top of the tag. I finished off with a Muse Token and a mini gear. Love your take on this month's tag. I was planning on doing a Christmas themed one, too, since T-day is over. I wanted to see if the white or metallic rubs worked with this resist technique. Most of my metallic rubs are stuck to the package. sad face. Lookin' good! Brrrrr! I can feel the chill in the air looking at this perfect winter take! LOVE your blues and the snowman!